Thank you Toledo for using TSW Products. Click HERE for the full news article! Chevron has specified TSW2 Multi-Master as the preferred graffiti remover for their stations. 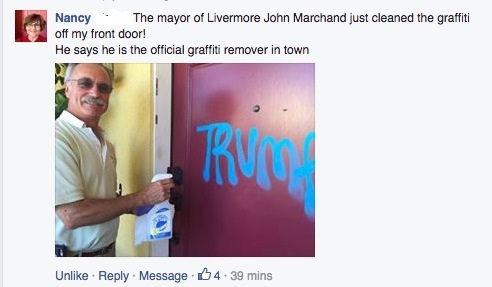 Livermore, CA Mayor carries TSW2 Multi-Master with him and removes graffiti everywhere he sees it. Lady called saying she had graffiti consisting of three different colors of spraypaint on her fence. We recommended using our TSW2R Multi-Master and below is her call after using the product. David in Texas sent us the before and after pictures below. David said, "all in alI probably invested 4 plus hours….three rolls of paper towels, two bottles of TSW9 and saved THOUSANDS of dollars not having to get the trailer redone! Ian with UC Santa Cruz called and said they love our TSW2 Multi-Master. They formerly used Goof Off but prefer TSW2 because it works better and has less odor. They also protect their murals with our TSW4 Acryli-Master coating. The Bay Area Air Quality Management District is using TSW9 Plasti-Master to remove graffiti vandalism from their vehicles. Received 12-7-14:"I have had a Shopping Center Maintenance Company for many years. I use your products and have recommended them to several city agencies. Your products are the best on the market." Your TSW2 product works, we are glad to use it. I woke up this morning to find my car had been spray painted last night. After trying to scrub it off and going to several stores in the Minneapolis area a customer at an auto parts store told me to find a place which sold TSW. From the way he described it, the stuff sounded magical. I looked it up online and found a hardware store which had it. I'll have to be honest, the price was a little steep, $26, for a single spray bottle -- but I was desperate. I bought it and sprayed it on and the paint came off like magic! PS - I attached a before and after photo of my car. PS - Your remover even works when it's 25 degrees outside. It's amazing. We use TSW2 Multi-Master to remove asphalt sealer from many surfaces.